Insectary strips are areas on your farm or in your garden planted as permanent habitat for beneficial insects. Our research has found insectary strips to be an effective tool in managing pests organically. 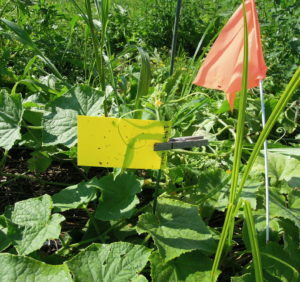 See our top considerations for planting insectary strips here, and read more about our research on using insectary strips to control the striped cucumber beetle here. Once you’ve planted your insectary strip, use these 3 scouting methods to determine what kind of pests and beneficial insects you’ve attracted. These 12 and 15-inch diameter nets are made from either muslin or polyester. Muslin nets are lighter in weight, good for general sweeping in grasses. Polyester nets are made of tough polyester and are designed for aerial applications. These nets can be purchased from Gempler’s, sweepnet.com, Great Lakes IPM, and BioQuip. 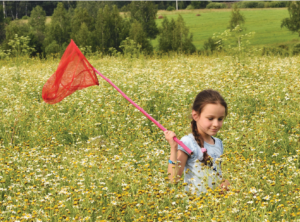 Sweep the net two to three times through the flowers to catch insects flying or hidden. Collect the insects into a glass jar and close it. Similarly, you can sweep the net over your crops to catch and identify pests that are feeding on your plants. 3″ x 5″ sticky trap cards can be purchased from vendors such as Gempler’s, Walmart, and Johnny’s Seeds. Early in the growing season, install these yellow sticky traps by peeling the covers on the sticky card traps and mounting each on a 3-ft long bamboo stick (find them at Ace Hardware) using a clothing pin. Come back after 24 or 48 hours, collect the trap, and identify the insects caught. These traps are used to catch ground-dwelling insects such as spiders and ground beetles. 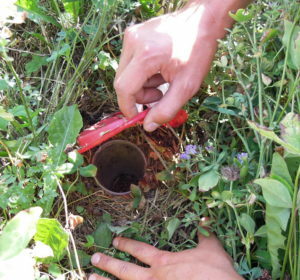 To build these traps, dig a hole in the ground the size of a 16 oz. plastic cup by using a bulb planter (available at Ace Hardware). Note: If you plan to monitor ground-dwelling insects in several locations, keep track by labeling the cup using a marker to indicate the location of collection. of the cups should be flush with the soil surface to allow easy access for ground insects. The top cup will be the one you remove to view insects. The bottom cup will remain in the hole for future use. using two metal stakes to protect insects from rain during the trapping period. Monitor the traps after 24 or 48 hours and identify the types of ground beetles and spiders collected in the trap. Release the insects afterwards to enhance their populations. Hoffmann, M.P., R. Ayyappath, and J. Gardner. 2002. Effect of striped cucumber beetle (Coleoptera: Chrysomelidae) foliar feeding on winter squash injury and yield. Journal of Entomological Science 37: 236–243. Rojas, E.S., M.L. Gleason, J.C. Batzer, M. Duffy. 2011. Feasibility of delaying removal of row covers to suppress bacterial wilt of muskmelon (Cucumis melo). Plant Disease 95:729-734.